Home » Learning Center » Jewelry and Lapidary » Questions About Lapidary and Jewelry Making » What Causes Fuzzy Refractometer Readings? I’m having trouble with fuzzy refractometer lines. And that’s when I can see lines at all. Sometimes the lines disappear when I put on the magnifier. The problem is worse when I’m trying to measure the refractive index (RI) of a small gemstone. I’m just learning to use the refractometer. Can someone tell me what I’m doing wrong? In order to get a good refractometer reading, the stone you’re checking must have perfectly flat and well-polished facets. If it doesn’t, this will cause a blurry band to appear. You must also use the correct amount of refraction fluid. (You can consult this article on refraction liquids commonly used by gemologists as well as this list of common household liquids you can use for RI testing). Just a tiny drop is enough. Too much or too little will give you fuzzy refractometer readings. Make sure you wipe the window clean before and after using the refractometer. (Use a soft tissue. Don’t use the ones that have conditioners in them. Get the cheapest store brand you can). 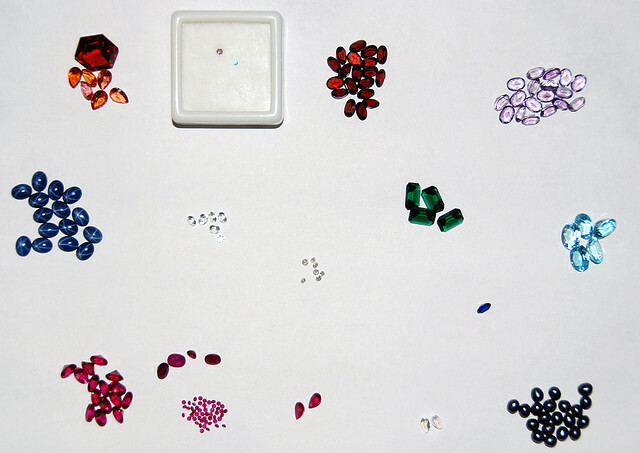 “Examples of Gem Images on The Refractometer Scale” by Donald Clark. One last note, sometimes you have to move your head up and down or left and right to get a good look at the line. If you see a good line without magnification, you should be able to locate it with the magnifier on. It takes a lot of practice to get good consistent RI readings! I assume you’re using a light reflecting refractometer. These have inherent limitations, since you are reflecting light at the intersection of the facet and the lens. Getting a fuzzy refractometer reading is quite normal. With smaller stones, obviously, the image is smaller. Therefore, less light is returned. I believe you are probably expecting more from your refractometer than it can deliver.